The definitive version of YO-KAI WATCH 2 arrives, with all the content of the original versions plus a large helping of brand-new Yo-kai mischief on top, including new quests, new locations and new Yo-kai to befriend. Get ready for the ultimate journey into the mysterious and mischievous world of the Yo-kai, as YO-KAI WATCH 2: Psychic Specters launches in Europe for Nintendo 3DS family systems this autumn. Providing the full YO-KAI WATCH 2 game experience, but packed with new features and content, YO-KAI WATCH 2: Psychic Specters offers a wealth of enjoyment, charm and mystery for both newcomers and existing Yo-kai fans alike. As the latest instalment in the YO-KAI WATCH series of games, YO-KAI WATCH 2 sees a group of sinister Yo-kai arrive in Springdale, determined to steal the Yo-kai Watch and bring havoc to the town and its residents. 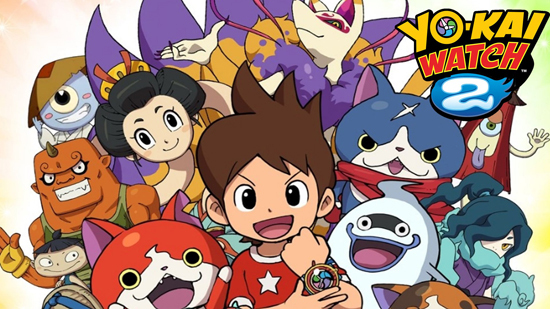 As Nate or Katie, the player must work to foil this wicked plot – exploring an expansive in-game world, befriending a colourful host of Yo-kai, and even travelling back in time to visit a past version of Springdale. Now, with YO-KAI WATCH 2: Psychic Specters, players can enjoy this epic adventure in its most definitive and complete form. Prepare yourself for the deepest and most immersive Yo-kai experience yet, as YO-KAI WATCH 2: Psychic Specters launches for the Nintendo 3DS family of systems this autumn.